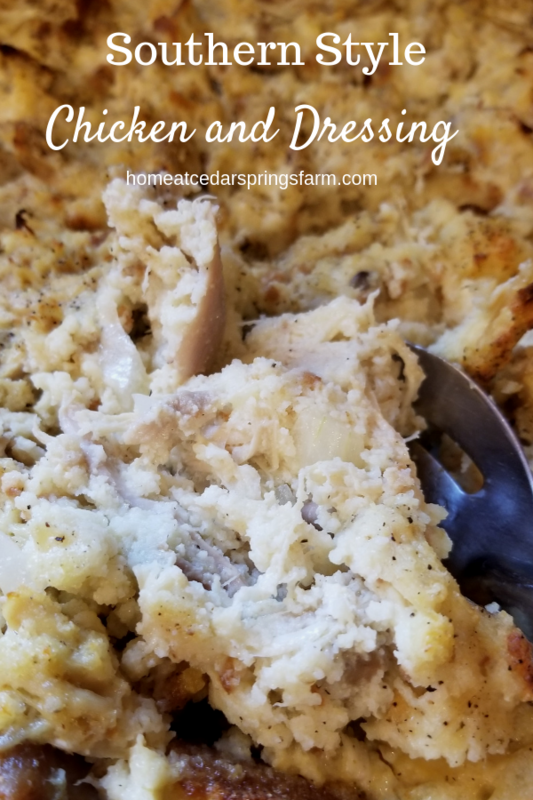 Chicken, cornbread, cream of mushroom soup, milk, eggs, onion, and butter all come together to make this delicious pan of dressing that has been served in our house for at least 40 years. 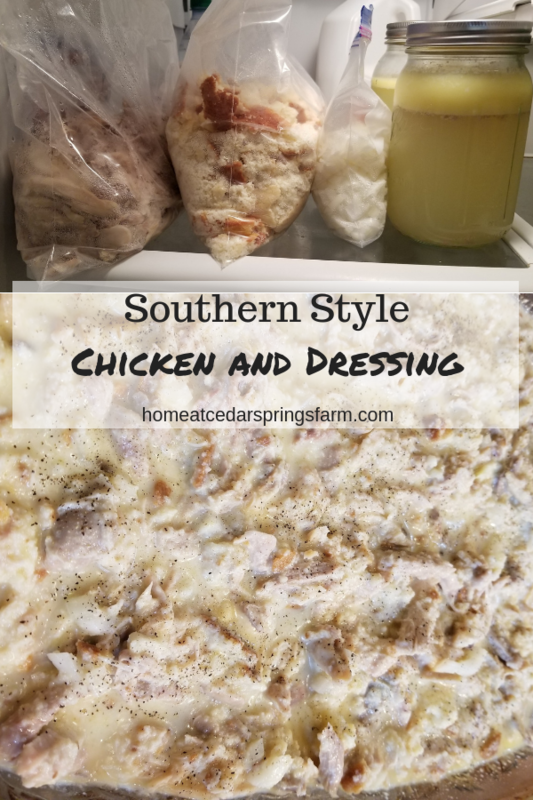 This was my mother in laws chicken and dressing recipe. She made this dressing every Thanksgiving and Christmas. She was known for her dressing and it was always fabulous. I have been eating this dressing for the past 32 years; my husband even longer. After she passed, I took over and began to make her dressing. I use her recipe and always follow it step by step. It is not difficult at all and it always turns out to be a delicious pan of dressing. This dressing is not your boxed dressing by any means. This dressing is made from scratch and it begins with homemade cornbread. If you prep everything the day before, you can prepare this dressing in no time. Grease a cast iron skillet or baking pan with oil and place in the oven to heat. Meanwhile, mix up the cornbread batter. Beat egg in a medium bowl. Add cornmeal mix, buttermilk, and oil. Stir well. Pour batter into heated skillet and place back in the oven. Cook for about 25 minutes or until golden brown on the top. Remove from the oven and turn out onto a plate to cool. You will need to make 2 pans of cornbread. While the cornbread is baking, boil the chicken. Boil 1 package chicken thighs (about 10) or 1 package of chicken breast (about 6) until tender. Cool, skin, debone and chop. Save broth. Cook 2 skillets of cornbread. You will use 1 1/2 pans of cornbread. (10-inch skillet). Crumble bread in a large pan or bowl. I use 2 bowls because there is so much to mix up. Enough broth to make the mixture thin. You don’t want it too soupy, but you do want it thin. I usually use close to 2 quarts. Pour into 1 or 2 casserole dishes and bake at 450 degrees until brown on top, about 45 min to 1 hour. If you are cooking this in one pan, it may take up to an hour. Just keep a check on it and when the top begins to brown remove from the oven and allow to sit about 10-15 minutes before serving. If you are looking for a special cake, my Carrot Cake is amazing. It always goes fast! 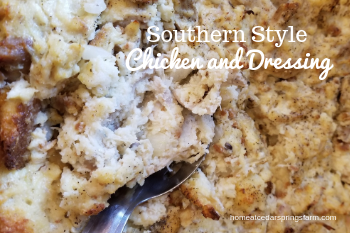 A delicious Cornbread Dressing that has been served in our home for the past 40 years. This dressing will feed a crowd and will have everyone coming back for seconds. 1 package (about10) chicken thighs or 1 package of chicken breast (about 6) Boil, skin, debone, chop. Preheat oven to 425 degrees. Grease a cast iron skillet or baking pan with oil and place in the oven to heat. Meanwhile, mix up the cornbread batter. Beat egg in a medium bowl. Add cornmeal mix, buttermilk, and oil. Stir well. Pour batter into heated skillet and place back in the oven. Cook for about 25 minutes or until golden brown on the top. Remove from the oven and turn out onto a plate to cool. You will need to make 2 pans of cornbread. Set Aside. Crumble cornbread in a large pan or bowl. I use 2 bowls because there is so much to mix up. Add: 1 large chopped onion, 1 stick melted butter, 1 can cream of mushroom soup, 6 beaten eggs, 1 1/2 cups milk, chopped chicken. Pour enough broth to make the mixture thin. You don't want it too soupy, but you do want it thin. I usually use close to 2 quarts.